Like hair and skin, teeth vary in colour. Some are yellower or darker than others, even when they are quite healthy. Teeth tend to get darker as people get older. Teeth sometimes become darker if their roots have been damaged or diseased and the 'nerve' has 'died'. Tooth colour can be very effectively lightened with Hydrogen Peroxide (bleach), used on either the outside or the inside of the tooth. Tooth bleaching is completely safe as long as the bleach does not touch your gums and burn them. Where the 'nerve' of a tooth has 'died' (through damage or disease) and the tooth's root has been filled, bleach is put inside the tooth, under a temporary dressing. The bleaching agent remains in the tooth for about a week before being cleaned out so that a white filling can be placed. The dentist will give you weak bleach jelly to use at home in a tray which fits closely round your teeth. The tray makes sure that the jelly does not burn your gums. You will need to put the tray in your mouth for a few hours on several occasions, as instructed by your dentist (probably over a period of weeks). The dentist will need to use a putty-like material to make moulds of your mouth (called 'impressions'), so a dental technician can make the tray to fit. At your next appointment, your dentist will check that the tray fits and show you how to put the bleach in the tray at home. Your dentist will make a note of your tooth colour using model teeth in different shades before they treat you. Look at the colour match yourself before the treatment, so you can compare it with the colour after bleaching. Your teeth may be sensitive to hot and cold food and drink for a few days after bleaching. 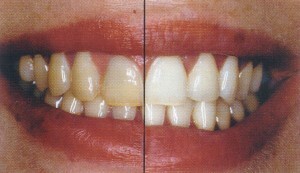 Bleaching improves the appearance of your teeth without removing any of the natural tooth surface. Bleaching is a better option than a crown or veneer if you want to lighten the colour of healthy teeth, as the placing of crowns and veneers involves changing the shape of the tooth.